Why bother with a consistent Self-Reiki practice? I hope I provide a convincing answer to this question in the article below, which was originally published in Silent Voices Magazine. 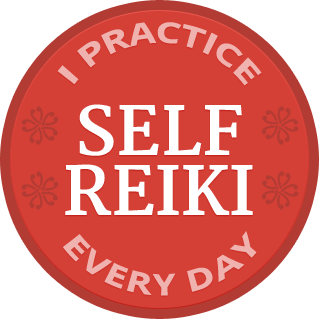 My Self-Reiki practice is the point around which my life pivots – calming, nourishing, sustaining and supporting. I cannot imagine who I would be without it! When you attend a Reiki 1st Degree course you will be given all kinds of information about Reiki practice – where it began, how to offer it to yourself and others, the Precepts (or underlying ideas of the founder) – and you will receive an “attunement” to this wonderful, healing practice. You should also have plenty of opportunity to practise Reiki on your fellow students – and on yourself. At this level, Reiki is all about self-care. One of the biggest hurdles students often face is to accept the idea that not only is it OK to practise self-Reiki daily but it is a priority. Self-Reiki practice is essential if we are to deepen our connection with Reiki and experience all the benefits of relaxation and associated personal development. Instead, students can throw all kinds of rocks in their own path. Being too busy is a favourite and, in particular, being too busy looking after other people. And, of course, we all know that life can seem to move ever faster and be more demanding every day. Well, there is more than one way to practise self-Reiki. First, let’s look at posture. Many students are taught a version of self-Reiki which is depicted in books as beginning with the person sitting upright, placing their hands on top of their heads and wearing a beatific smile. Which is fine – until you try it and realise that after a very short while, your arms are screaming and you begin to see why this position is favoured by security services to render bad guys harmless. It hurts. Lie on your side on a bed or other soft surface. Now place your hands on top of your head. With one arm resting on the bed, perhaps support your top elbow with a pillow. Better? From there you can move your hands to your face or throat area, rolling onto your back for hand positions on your abdomen. The basic point is that it is fine to support your arms during self-Reiki practice, whether you sit or lie down – be inventive! No problem – sweet dreams – your body’s self-healing mechanisms that have been activated by the self-Reiki you did manage, will continue their work. Or you could do your self-Reiki practice first thing in the morning, which is a wonderful way to start the day. What, not even five minutes with your hands placed on your heart or your abdomen? Really? How about placing hands while the kettle is boiling? Or, as one student reports, whilst waiting in a queue she will hold her own hand, palm to palm, and feel the Reiki warmth begin immediately, soothing, calming. Of course, in an ideal world, all students would find space in their day for a full self-Reiki session but, as we know, life isn’t always ideal. However, it is on those non-ideal days that we need self-Reiki most and that is when a habit will stand you in good stead. You are more likely to do your practice on the tough days if it is “just what you do”. Regular practice deepens the connection with our own healing mechanisms and may bring with it a clearer awareness of what we need to do to take better care of ourselves. And this is often the biggest hurdle for students to overcome. The idea of taking time to meet our own needs seems unacceptably selfish to many people. It may be useful to think about how we develop as individuals – a process known as “individuation”. When we are first born, we are completely helpless and our parents or carers give us everything we need. As we grow through childhood, we slowly begin to take more responsibility for asking for what we need rather than the adults always intuiting and then deciding for us. We also begin to take charge of meeting some of those needs for ourselves. During adolescence, we go through a necessary process of pushing away the care and control of our parents and, if all goes well, we arrive in adulthood capable of healthy relationships with clear, respectful boundaries. Sometimes, that process may not go so well and we can develop a pattern of relationships that are engulfing, confusing and can leave us uncertain as to who we really are. So, here we are, with self-Reiki offering a really profound way for us to fulfil some of our own needs – for comfort, relaxation, self-compassion. Is it reasonable to continue to pass the responsibility for meeting those needs to other people, rather than look after ourselves? And in this age of commercials that exhort us to buy cosmetics “because you’re worth it…” is it really so hard to believe we are worth a few minutes of our own time? In the foundation of our self-Reiki practice, this healthy process of personal development and individuation can be supported – Reiki works at all levels of our being, after all. What if this deepening self-compassion also enlarges your compassion for others? “As I do this for me, so my ability to care for you also deepens”. Certainly, the more calm and grounded we are, the more we can be there for other people. But we have to practise being there for ourselves first. And there is no better way to support that calm and grounded version of you than to form the habit of a regular, thoughtful self-Reiki practice. In comfort, of course. One Response to What’s the point of Self-Reiki? Reblogged this on My Reiki Story.